Free-to-play MP component available in mid-September. As the closest thing we'll get to Masterchief until the arrival of Halo 6, the launch of Halo 5: Forge next month is likely to be of interest even to those ambivalent towards the series. The free-to-play offering is basically a map editor, but there's also a 16-player multiplayer component, meaning that, yes, we'll soon be able to play Halo MP in an official capacity. 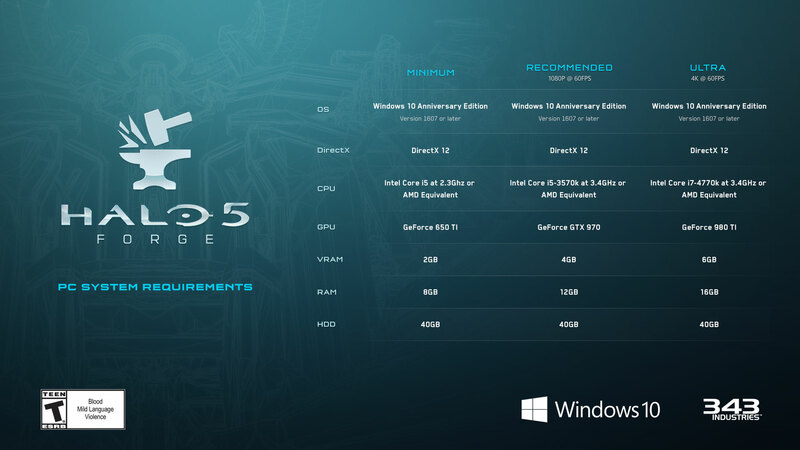 The shooter's system requirements are now out, and it looks like fairly modest rigs should be capable of running it. You'll only need a 650 Ti to run it at minimum settings, but for a 1080p / 60fps experience (ie, one that's on par with the Xbox One version) you'll need a GTX 970 with 12GB of RAM and an i5-3570k. Meanwhile, those with a 980 Ti and i7-4770k or equivalent should be able to run it in 4k. There's one snag, though it won't come as a surprise to anyone familiar with Microsoft's first-party software rollouts on PC thus far: you'll need Windows 10 Anniversary Edition to run it. If you declined to update to Windows 10 before the free period expired, well, you either buy Windows 10 or miss out, I'm afraid. Check out the full requirements below, or here.